Getting yelled at in an elementary school auditorium isn’t much fun for most of us. It’s probably even worse when you’re an adult, and those yelling, questioning your integrity and intelligence, are also threatening to take away your job. It’s not surprising that elected officials anticipating trouble are ducking them; this year, it’s mostly Republican members of Congress skipping the schools and the waves of opposition Trump has provoked. But some Democrats, particularly those in states carried by Trump, have also found other ways to fill their time. Marco Rubio (R-FL) originally said that he’d be out of the country, but he found himself in South Florida, where constituents wanted to meet. He then acknowledged that he knew people would yell at him, and has no interest in embracing that experience. Senator Claire McCaskill (D-MO) spent part of her break touring the Mexican border, and sent staffers to meetings in her place; she said she’d schedule some meetings at the next Congressional recess. Representative Louie Gohmert (R-TX) said it was much too dangerous for him to attend a meeting, because of the anger everywhere and crazy people with guns. There’s obvious irony (hypocrisy?) here: Gohmert has never supported any restrictions on access to guns, and interrupted a Democratic sit-in on the House floor about gun control last year, screaming that radical Islam was the prime threat to public safety. The resistance campaign is organizing around the absences, calling out legislators who won’t show up for meetings. Although there’s nothing in the Constitution that requires legislators to hold open meetings, lots of people think it’s part of the job– including elected officials who have taken their knocks. She also says that Gohmert might feel more secure if he supported some of the common sense gun control reforms that she’s been promoting since leaving office. I understand why members of Congress don’t like it…But you know what? You asked for the job. Go do it….Welcome to the real world of responsibility…The fact is that, right now, the heat is on the Republicans. It’s on us. … We now have two-thirds of the statehouses in America. We have the House. We have the Senate. We have the White House. It’s now on us to produce results. And one of the things that we need to do is engage with the public. Local organizers are often taking cues from online guides, like Indivisible. They’re also watching other local groups and paying attention to the news. Most notably, they’re drawing on the vast archive of writing and video on the Tea Party disruptions at town hall meetings in the summer of 2009, intended to stop health care reform. The Tea Party built on the infrastructure of well-funded conservative groups, particularly Americans for Prosperity and FreedomWorks, and they had printed guides as well. Eight years later, it’s still easy to find some in print and online. Here’s an excerpt from a guide drafted by Bob McGuffie, a Tea Party activist in Connecticut. The night of my town hall, I knew the crowd was effectively stage-managed and that many people there didn’t live in my district. But I didn’t make an issue of that, as President Trump does now. It was my obligation — my job — to listen to disagreement. The people there were Americans expressing their anger and anxiety; exercising a constitutional principle to petition their grievances to government. It wasn’t a pleasant night, but it was a patriotic one. Representative Israel voted for health care reform, and was reelected…several times. 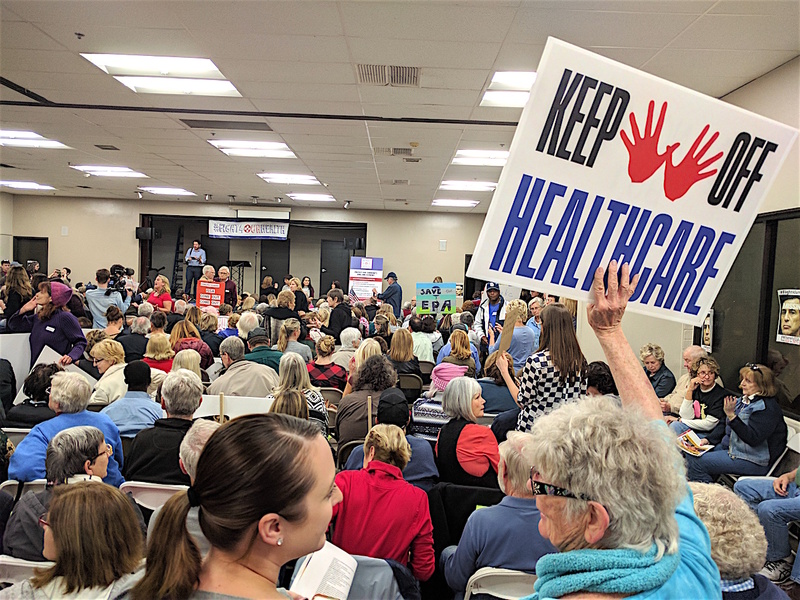 Thus far, the Trump resistance meetings have produced some provocative video and exposed some ill-informed and timid elected officials, but nothing yet comparable to the physical disruption of some of the Tea Party meetings. I suspect, however, that more is coming. The important work ahead for the resistance is channeling the drama of the demonstrations at townhall meetings into the mundane work of electoral competition, recruiting, funding, and running opposition candidates. Given the extreme polarization, residential sorting, and gerrymandering that characterize Congressional districts, it’s going to be far easier in most districts to stage a powerful meeting than to unseat an incumbent. Rep. Chaffetz, for example, beat his Democratic opponent by more than 130,000 votes. Although there are more than enough Democrats to fill an auditorium, winning at the polls is a more distant goal. But America’s bigger and even more diverse than Utah’s 3rd district. Nearly two dozen districts voted for Hillary Clinton and sent Republican incumbents back to Congress; my district, California’s 45th, is one of them. These districts are where the political influence of the emerging resistance movement will be tested. This entry was posted in Uncategorized and tagged Americans for Prosperity, Chris Christie, Claire Mccaskill, Democratic Party, Donald Trump, FreedomWorks, Gabby Giffords, Indivisible, Jason Chaffetz, Louie Gohmert, Marco Rubio, Mimi Walters, Republican Party, Steve Israel, tea party, townhall meetings. Bookmark the permalink.